Drimys winteri is an amazing small tree or large shrub that delights us at this time of the year with its beautiful large fragrant flowers. It is a native of Chile and Argentina, namely the temperate coastal rainforests, Magellanic and Valdivian. In these areas, it’s normally found living just 1200m above sea level and prefers damp spots near streams in rich fertile soil. It grows up to 20m tall in its native areas but manages up to 10m here in the uk. It does survive pretty well here and can be found growing up as far northern Wales. The evergreen aromatic leathery leaves themselves have a are a mid-dark green colour and oblong to lance like in shape, reaching about 20cm when long. The jasmine scented flowers are borne from late winter to late spring here in the uk and are well worth growing for the scent alone. The bark is also one the highlights of this small tree and is a lovely rich brown colour. 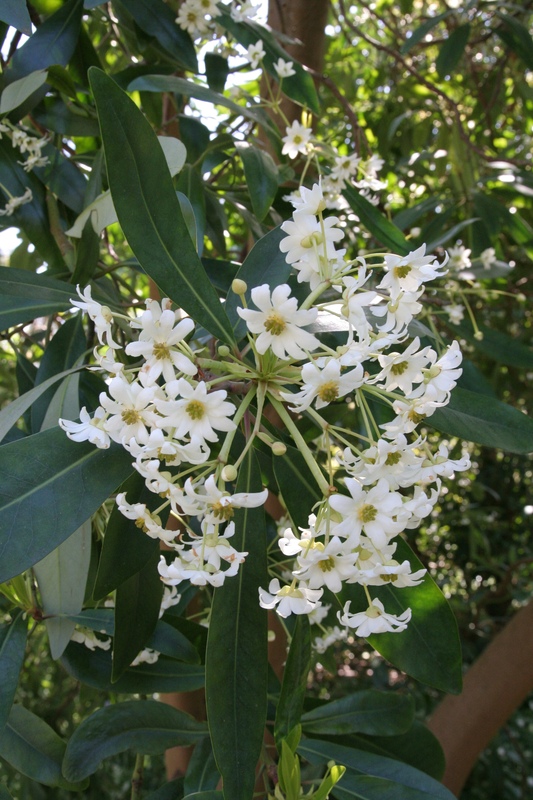 Drimys winteri or winters bark was discovered between 1577-80 by possibly John Wynter. John Wynter was the captain of the Elizabeth, the only other ship that made it around Cape Horn with Sir Francis Drake sailing the famous Golden Hind. After a bad storm, the two vessels were separated and it is thought Elizabeth had illness aboard. John set a boat a shore to look for medical herbs and they brought back the bark of Drimys winteri. They discovered it contained vitamin C and it made a excellent remedy for the dreaded illness aboard ships at the time, scurvy. For many centuries it was used to fight scurvy, indeed Captain James Cook drank an infusion of it. The bark of Drimys winteri is also thought to aid indigestion, colic and dandruff. It is also ground up and used just like pepper in its native countries. Drimys winteri prefers a well drained moist soil, ideally one that’s neutral to acidic, that said it will tolerate some chalk and grow ok in deeper alkaline soils. Surprisingly it will tolerate strong winds but it doesn’t like to be exposed to coastal winds containing salt. It is hardy down to -10c. Pruning wise it doesn’t need any pruning other than to shape it and removal any crossing branches. It is thought to be pretty resistant to honey fungus, so may be a good option if it is problematic in your garden. Drimys winteri is pretty easy to propagate, seed being the easiest way, sown fresh in the autumn in a greenhouse and once potted on, give some protection in something like a cold frame for the first year or so. Semi ripe cuttings with a heal work well and are best taken in July or August. It can be found in many gardens like RHS Wisley, Sir Harold Hillier Gardens and many gardens in Cornwall. Indeed it is quite widely grown. It is also sold in many good nurseries like Burncoose of Southdown.